Silver Medal at RHS Chelsea Flower Show! Our stunning garden inspired by Royal Leamington Spa has been awarded a Silver medal at RHS Chelsea Flower Show! The exhibit created especially for the world-famous flower show to celebrate the town’s deep horticultural roots has achieved the highly coveted Silver medal. The garden was created by internationally-recognised florist Sarah Horne and garden designer Debbie Cooke, both based in Leamington, with Warwickshire-based metal sculptor Clive Sanderson designing and making its Regency style arbour enclosure. It is the first time that Sarah and Debbie have combined their floristry and gardening expertise in a design that has captured the imagination of Leamington and will create a lasting legacy for the town. Sarah said: “I am absolutely thrilled and honoured to have won such a prestigious award at Chelsea Flower Show on behalf of my home town. Debbie said: “I have been awarded RHS medals for my garden designs before but to win a Silver medal at the most famous flower show in the world is beyond my wildest dreams, particularly as Sarah and I had never worked together before. 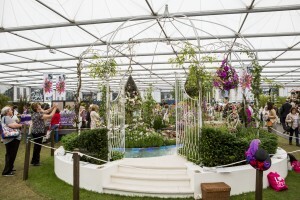 After months of preparation, the garden took a week to build in the showground’s Great Pavilion before the gates were opened to the world’s media and members of the royal family for an exclusive preview on Monday (May 19) ahead of the general public. Around 160,000 visitors are due to attend the five-day show, which runs until Saturday, May 24, and more than three million viewers are expected to tune in to television coverage. The event is popular with celebrities, politicians and captains of industry. The exhibit, reaching four metres in height and six metres in diameter, captures the essence of the Regency town with an ornate circular arbour leading into the garden depicting different landscapes. A trio of floral pods hanging from the canopy roof each represent exotic, indulgent and naturalistic aspects of the town, whilst a table and candelabra water feature highlight dining by its river and lakes. Planting is based upon a picnic in a park, with cushions of fresh flowers and floral cupcakes on a thyme and chamomile lawn. The ambitious project has been managed by BID Leamington, which harnessed the groundswell of support within the town to make it happen. Around 70 local businesses alone have contributed in a variety of ways, painting parties have been held to put the finishing touches to the structure and a ‘Blooming Buddy’ group was even formed to enable supporters to follow the garden’s progress from paper to plant. 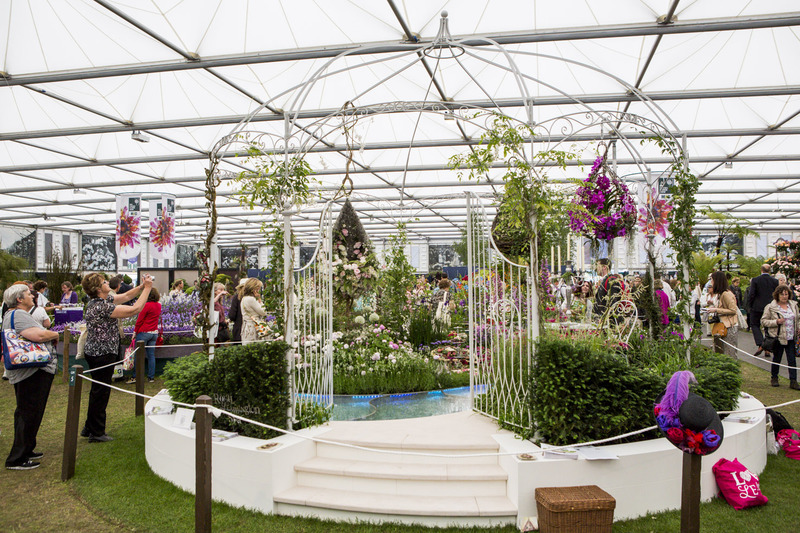 Stephanie Kerr, director of BID Leamington, said: “To be awarded a medal at the Chelsea Flower Show is the ultimate in the horticultural world and so for Leamington to win a Silver medal is incredible and something for the whole town to celebrate. “We couldn’t have got this far without the amazing support that we have had from so many people and local businesses in Leamington and beyond, and would like to thank everyone who has helped. “We can’t wait to bring the beautiful handmade arbour from the garden back home to Leamington where we hope it will be given a permanent place in the Pump Room Gardens so that everyone can experience this Chelsea magic.